As a resident of Canada, you are eligible to enjoy exclusive savings on select sailings of the deluxe, 332-guest m/s Paul Gauguin. 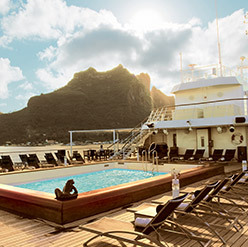 Depending on the voyage you choose, you'll enjoy savings of 10-25% off standard all-inclusive fares on itineraries to Tahiti, French Polynesia, Fiji, and the South Pacific aboard this legendary, award-winning ship. 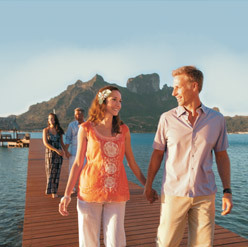 Plus, roundtrip airfare between Los Angeles and Tahiti is included in your fare! Space is extremely limited aboard our small ship, and at these savings, it's bound to fill up fast. Reserve today! Tahiti receives fewer tourists in an entire year than Hawaii does in one week! Offer is valid for residents of Canada and for new bookings only. Port, security, and handling fees are additional. Offer is combinable with applicable past guest savings but may not be combinable with other offers. Restrictions apply. Call for details. From Travel+Leisure Magazine, August 2015 ©2015 Time Inc. Affluent Media. Used under license. Travel+Leisure and Time Inc. Affluent Media are not affiliated with, and do not endorse products or services of Paul Gauguin Cruises.